After twenty one years, John and Abby Reynolds are back together and feeling like newlyweds. Together they are convinced they can handle the issues of their past, the questions from their children, and even the high-school politics that drain the joy from John's coaching career. But then disaster strikes...the type of tragedy John and Abby never expected. The squeal of brakes and the crunch of metal changes everything. Suddenly devastation tears at the heart of their family, and the depth of their existence. In the process, their children falter in their faith and guilt colors everything about the future. Fumbling for forgiveness and hoping for a miracle, John and Abby must remember what is important and cling to that above all else. Together, they're determined to move on with their lives. but is "together" enough for a future they never expected? USA Today and New York Times bestselling author Karen Kingsbury is Americas #1 inspirational novelist. There are nearly 5 million copies of her award-winning books in print, including more than two million copies sold in the past year. Karen has written more than 30 novels, nine of which have hit #1 on national lists, including award-winning Oceans Apart, One Tuesday Morning, and Beyond Tuesday Morning. 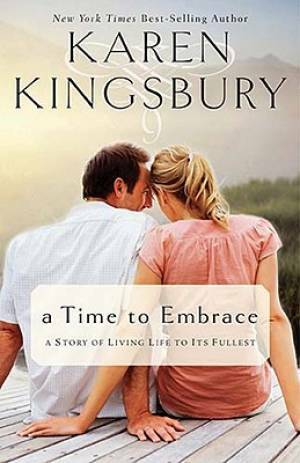 A Time To Embrace by Karen Kingsbury was published by Thomas Nelson in June 2010 and is our 14305th best seller. The ISBN for A Time To Embrace is 9781595546890. Be the first to review A Time To Embrace ! Got a question? No problem! Just click here to ask us about A Time To Embrace .